Einstein’s Theory of General Relativity, published in 1916, suggested that the universe had not always existed. But he had one difficulty; his equations showed the universe should be expanding. Because physicists at the time believed that the universe was static or in steady state, neither expanding nor contracting, Einstein introduced a term called the “cosmological constant” into his equations in order to absorb the expansion. Then the works of Georges Lemaître and Edwin Hubble in the 1920s demonstrated that the universe was expanding and that Einstein’s cosmological constant was a mistake. This left a lot of astrophysicists very unhappy. Many felt that Lemaître, a Roman Catholic priest, was trying to inject religion into physics by suggesting that the universe had a beginning. the biggest blunder he had ever made. Thus was born the Big Bang Theory, which states that the universe had its origins in a fiery explosion billions of years ago. 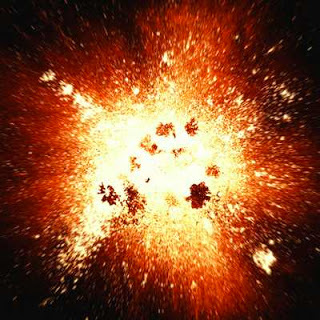 Cosmologists (scientists who study the origin of the universe) believe the universe began as an infinitely dense, hot fireball. They call the single point that contained all the matter in the universe a singularity. Time began at the moment this fireball exploded, stretching space as it expanded rapidly. The universe, at first no bigger than the size of a proton, expanded within a microsecond to the size of a basketball. Gravity came into being, and subatomic particles flooded the universe, slamming into one another, forming protons and neutrons (elementary particles that form atoms). Three minutes after the big bang, the temperature of the universe had cooled to 500,000,000°F (277,777,760°C). Protons and neutrons began to combine to form the nuclei of the simple chemical elements hydrogen, helium, and lithium. In 1964 evidence of cosmic background radiation was discovered and the big bang theory received a wide acceptance from scientists, who believed that this Cosmic Microwave Background Radiation (CMBR) was given off when the big bang occurred. This radiation appears as a weak hiss of radio noise coming from all directions in space. It is, in a sense, the oldest light in the universe. When astronomers measured this CMBR, they found its temperature to be just under −450°F (−270°C). This was the correct temperature if the universe had expanded and cooled since the big bang. In 1980, the American astronomer Alan Guth proposed an extra idea to the big bang theory called the inflationary theory. It suggested that at first the universe expanded at a much faster rate than it does now. This concept of accelerated expansion allows for the formation of the stars and planets that we see in the universe today. Guth’s inflationary theory was supported in April 1992, when NASA (National Aeronautics and Space Administration) announced that its Cosmic Background Explorer (COBE) satellite had discovered some fluctuations. COBE looked about 13 billion light-years into space (hence, 13 billion years into the past) and detected tiny temperature fluctuations in the cosmic microwave background. Scientists regard these fluctuations as proof that gravitational disturbances existed in the early universe, which allowed matter to clump together to form large stellar bodies such as galaxies and planets. In late 2000, scientists added further supporting evidence to the validity of the big bang theory when they announced that they had analyzed light from a quasar that was absorbed by a distant cloud of gas dust billions of years ago. At that time, the universe would have been about one-sixth of its present age. Based on their findings, the scientists estimated that the background temperature at that point was about −443°F (−264°C), a temperature mark that agrees with the prediction of the big bang theory. The major problem with the Big Bang Theory is that it cannot give the answer to the beginning of the universe, rather it explains the process that led to its formation. It speaks more about the effect than the cause. Remember that the Big Bang wasn’t a sudden explosion of energy in some empty part of space at some distant moment in time. According to the theory, all space, time and energy came into existence together in that “bang.” Before the Big Bang, there was no time. There was no space. Then, suddenly, an exceedingly dense, incredibly hot, infinitesimal ball of something – everything – appeared somewhere, somehow for reasons unknown and began to expand rapidly with our whole world inside of it. It does not solve the central problems of the origin of time and the need for infinite energy to cause the Big Bang. The big bang scenario speculates that the marvellously ordered universe randomly resulted from a gigantic explosion. Never in the history of human experience has a chaotic explosion been observed producing an intricate order that operates purposefully. An explosion in a print shop does not produce an encyclopaedia. A tornado sweeping through a junkyard does not assemble a Boeing 747. No building contractor dumps his materials in a yard, attaches sticks of dynamite, and then waits for a completed home from the resulting explosion. The idea is absurd. Evolutionist Donald Page was correct when he wrote: “There is no mechanism known as yet that would allow the universe to begin in an arbitrary state and then evolve to its present highly ordered state.” The Big Bang theory in itself can’t prove the beginning of the universe. A supernatural force beyond the laws of physics is needed for it. Who Banged the Big Bang? Atheist-turned-agnostic astronomer Fred Hoyle, who coined the term “Big Bang,” famously stated, “A common sense interpretation of the facts suggests that a superintellect has monkeyed with physics.” As Hoyle saw it, the Big Bang was not a chaotic explosion, but rather a very highly ordered event, one that could not have occurred by random chance. The question of what caused the Big Bang became more pressing with the publication in the late 1960’s of the Space-Time Theorem, by cosmologists Stephen Hawking, Roger Penrose, and George Ellis. This theorem uses general relativity to prove that matter, energy, space, and time all had their origins in a singularity (a geometric point of zero size). If space and time had a beginning, then something that caused the Big Bang must be beyond space and time. This “something” that transcended space and time was a “Someone” — the transcendent God revealed in the Bible. Those who have studied the Bible know that there was a creation event; that God created something (in fact, everything) from nothing. But was there actually a “big bang”? Is there any biblical evidence of such an occurrence? The Psalmist wrote, “By the word of the Lord were the heavens made, their starry host by the breath of his mouth. He gathers the waters of the sea into jars; he puts the deep into storehouses. Let all the earth fear the Lord; let all the people of the world revere him. For he spoke, and it came to be; he commanded, and it stood firm” (Psalm 33:6-9). It is by the Word of the Lord that creation took place. Again we read, “In the beginning was the Word, and the Word was with God, and the Word was God. He was with God in the beginning. Through him all things were made; without him nothing was made that has been made. In him was life.” (John 1:1-4). The Scriptures are clear that when God speaks, things happen. All the stars, planets, galaxies, as well as all the life on earth came to be, because God spoke the word and it came into existence. Just what does the voice of the Lord sound like? The Scriptures describe a most awesome sound coming forth from the mouth of God. “Out of the brightness of his presence clouds advanced, with hailstones and bolts of lightning. The Lord thundered from heaven; the voice of the Most High resounded” (Psalm 18:12-13). No one was there to hear the sound at the moment of creation but the cosmic microwave background radiation still resounds with the radiant energy of an explosion from long ago. The Word of God was given and the universe sprang into existence at His command. It was a mighty big bang, indeed.